Enlarge (Reduce) text size by pressing “+ (-)” button while holding down “Ctrl” button. - "Hokkaido Univ." : Books and journals (including e-books and e-journals) available at Hokkaido University. - "CiNii Books" : Books and journals available at the libraries of universities and institutions in Japan. - "CiNii Articles" : Academic papers published in Japan. - "Repositories" : Academic papers available through Institutional Repositories in Japan. - "Calil" : Books and journals available at public and university libraries in Japan. - "WorldCat" : Books and journals available at the libraries around the world. How to use "Simple Search". Please choose the database to use. Keywords remain in the search column when switching into another database. If you type two or more words, the result shows those of perfect match with both (each) keyword(s). 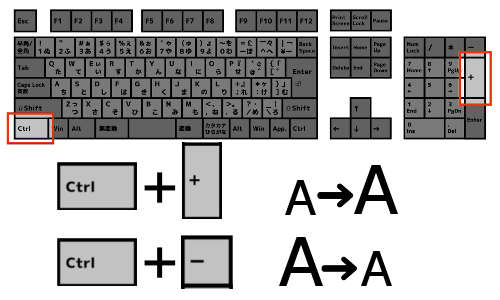 For peculiar characters such as Kana, Alphabet, and Cyrillic, keyboard typing is also available. The simple search can be switched into the Advanced search by pushing the link. When you click on the logo on top left of the screen, you can return to the top page. How to use "Advanced Search". Please choose the database to use. Keywords remain in the search column when switching into another database. You can specify the type of the material. It is difficult to distinguish whether material is bound as a book or a journal. Therefore it is recommended to use this option only when you intend to narrow the results by specific type of material. You can select specific library (location) to search. You can search by search items. You can search by specific country of publication. 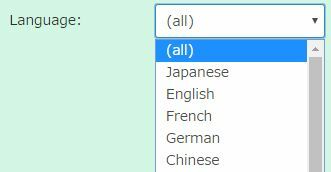 You can search by language. 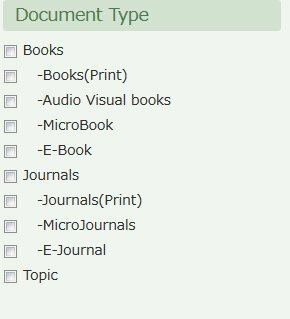 You can search by subject (category) of the content. You can search by media type. You can search by specifying the collection. The result can be switched into ascending or descending order. You can select the number of search results shown per a page. Here are some tips for getting good results upon your search.
? The database is case-insensitive, e.g., search by "abc", "ABC," and "Abc" returns the same result. Either full or part of the title/series name can be used for search. For title/series name including Kanji, either Kanji and Hiragana phonetic can be used. ✽ Supported characters: Chinese characters (Kanji), Hiragana, Katakana, the Roman alphabet, Cyrillic alphabet, and Greek alphabet. Either full or part of the author/editor name can be used for search. 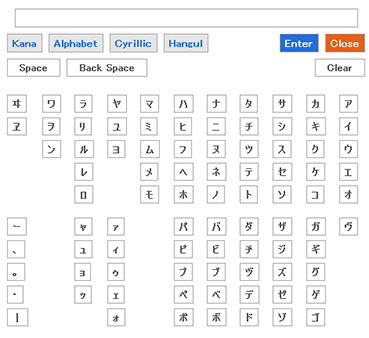 For the name including Kanji, either Kanji and Hiragana phonetic can be used . For some translated books, Katakana phonetic can be used.
? Search by the name of publisher. Japanese phonetic is unsupported. Subject here means the theme and/or topic of the book. The result shows the list of materials which concider the searched theme/topic. Use full sentence of subject. Hyphen "-" can either be in- or excluded. Search by ISSN (International Standard Serial Number, an unique number to identify journals). Search by standard classification number. in some cases, this number is different from the number on the book label. 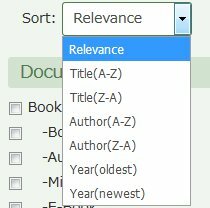 Search by classification number(same the number on the book label).
? Search by "Call Number", a pair of classification number, author symbol and series number (if any). Call Number is printed on a label on a spine of the book. Search by a unique number given each book (printed on barcode label on the book cover).
? Search by the Library Congress Card Number (replacing the hyphen with 0). Search by National Diet Library Card Number (NDLCN) and National Diet Library Periodical Number (NDLPN). Search by CODEN, the number given by "American Society for Testing Materials". Search by (NCID), given by NACSIS-CAT. Search by ID given by National bibliography making organization. 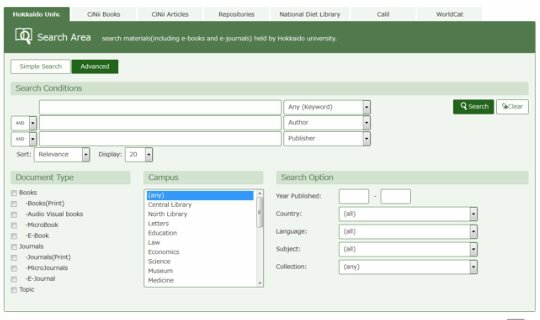 Search by Journal Code or school unique number. Search by standard numbers other than ISBN, XISBN, ISSN, NBN, and NDLCN (if any). Wildcard (*) enables you to search with partial (prefix)-match. For example : The search by the keyword "communi*" will list up materials include either "community" or "communication", etc. Exact matching search can be done by typing "# (pound sign)" at the beginning of the keyword. 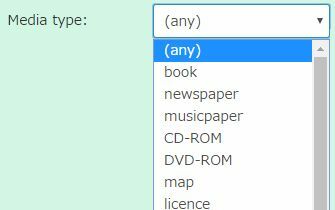 Exact-match search can be applied when any of the following options are selected. In this case, search for materials including a phrase "Historical　dictionary", such as "Historical　dictionary　of　Tokyo" and "European　historical　dictionary　series" are searched. To search for records containing all the keywords entered, use "AND" operator in advanced search. In this case, search for materials including both "beautiful" and "life". Select AND operator and locate space between two words or put "*" in between them, e.g., "A * B" or "A B", search result includes both A and B. * AND operator is not available for "Full title" and "Author"
▼　Example of separated by "*". ▼　Example of separated by space. 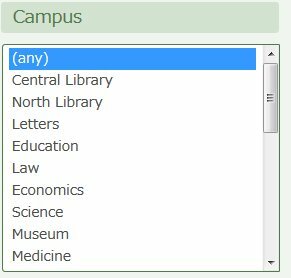 To search for records containing any of the entered keywords, use "OR" operator in advanced search. In this case, search for materials including either "Yosano" or "akiko" or both of them, e.g.,"A + B", search result includes either A or B, or both A and B. ▼　Example of separated by "+". To exclude a certain keyword, use NOT operator in advanced search. In this case, search for materials include Charlotte but not Bronte. By join keywords with half-width minus (-) such as "A - B", search for materials include A but not B. ▼　Example of separated by "-".